No flowers here, but with Echeverias, who needs flowers? We wish a Happy Thanksgiving to all who are celebrating this holiday. We give thanks, not for the excess accumulation of things which has come to signify our culture, but for the gifts of life and love and hope for all of you, wherever you my live. Another plant which has been blooming like mad is Gibbaeum dispar. I especially appreciate the neat little clumps with their bright flowers at this time of year. Tomorrow is Thanksgiving Day here in the U.S., so I'll be taking a day off. We'll be having a small simple meal, including a small "free range" turkey, with our younger son, Naiche. No big huge over-consumption here. And on Friday we'll be assiduously avoiding the madness which has come to be called "Black Friday" for the day the stores break into the black financially. Huge sales. Huge crowds. Yuk! Like I said, the Fenestrarias are flowering. So I went out to the greenhouse and took a couple of photos today. Another mesemb that's sending out its flowers, good old "Baby Toes". They can have yellow or white flowers. Now, to be honest. This is an older photo. I didn't have time to photograph the plants today, but tomorrow - both the white and yellow flowered ones. And another "to be honest". We tend to forget to water these plants when they need it in the winter because most of our other plants don't especially want to be watered. We're trying to do better and they like us for it. I just don't know how people resist them! Another Lithops with a white center to the flower is Lithops olivicea, which has been flowering the last couple of days. I think this photo catches the "shimmery" vitality of these little flowers. Finally, I'm back...with more Lithops. This time it's Lithops helmuthii which is flowering. And what flowers! These photos don't do them justice. They literally shimmer in the sun light. Note the distinctive white centers to the flowers. I went to the OCSS meeting tonight. Good turnout, but a pretty disorganized meeting. We must do better than this. But, the end result is that I'm bushed!!! My apologies. I've been very busy redoing our nursery web pages. This is something I do myself and I learn as I go. Even through all my muddling, I think the end result will be well worth it. I do have some new photos and will get them up as soon as I have time. Thanks for your patience. These vary a lot in color depending on the light. The plant is characterized by two distinct forms of leaves, the outer ones longer than the inner ones. Now generally considered to be swallowed up in the Parodia genus, this is a really outstanding plant. Unlike some of the Lobivias, the plant itself is a beaut, even when it's not flowering. This is Echeveria 'Lola' and it's another one of my favorites. It makes a very impressive display - all year long. It's been a long time since I've mentioned that my wife of 41 years - Lynn-Marie Kara - is an artist. This is her latest work, a portrayal of Lithops dorotheae, and - for a short time - she is offering laser prints of this and some of her other works for a special price of $35.00. I don't usually get this "commercial" in my blog, but - hey - I'm proud of her work. Ah yes! This helps me remember that Summer will come again! These are the lovely flowers of Escobaria missouriensis var. asperispina. Another plant which is quite hardy if protected from too much moisture. 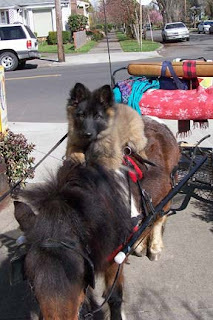 To end the day with a little humor, this is Osita, our now grown up Belgian Tervuren on the back of Ladybug, our miniature horse out at a neighborhood coffee shop. She's grown up now and doesn't quite fit on Ladybug's back, but they're still the closest of friends. Today was another sunny Fall day so I spent most of the time up on the ladder putting up new gutters or going to the hardware store to get materials. I did venture into the greenhouses a couple of time and the Lithops are going wild with flowers. Have to get the camera out tomorrow! I don't have time to pull out a photo from the archives, so I'll have to be photo-less tonight. Later. I guess this is my favorite Gymnocalycium. The flowers are large and impressive, the body of the plant is classically beautiful, and it flowers dependably every year. Some find it hard to grow but we've never had any problems. However, it does need a potting mix with extra good drainage.